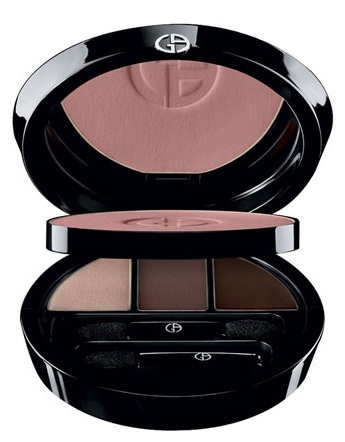 Giorgio Armani Beauty is offering unique, limited-edition colors for Fall 2012. The Easy Chic Collection offers two classic Face & Eye Palettes ($88), Neo-Black and Neo-Brown (which I previewed here). I ordered both palettes from Nordstrom's Web site. Only one, Neo-Brown, has arrived. The new signature classics feature an oval-shaped, black lacquered double-tiered case with a magnetic closure inspired by the Rouge d'Armani Lipsticks. On the first tier, you'll find a feather-light powder with micronized particles of Micro-Fil technology to illuminate the skin with the signature Armani glow. On the second tier, you'll find two matte eye shadows in intense hues and a shimmering illuminator - also formulated with Micro-Fil technology. Neo-Brown (#2, you won't find a name on it, typical of Armani Beauty) offers a glamorous look that plays on nature's palette of autumnal tones. The sheer rose blush is ideal for shaping the complexion with a luminous veil of rosy pink. It's partnered with Greige, Brown, and Earth Brown shades for the eyes. I am wildly in love with two of the four shades - the blush and the Greige illuminator - and I will use the other two, darker shades as liners. Those whose skin is darker than mine will find the darker shades more versatile. See what you think in my swatch photos. I applied all shades with a sponge-tipped applicator and took my photos in full, mid-day sun. The pastel rose blush at the top of my arm is a beautiful shade and will work equally well for cool- and warm-toned complexions. The color is a slightly warm pink, without any overt shimmer, but with a liveliness that's flattering. The shimmering taupe (Greige) took my breath away. I'm not sure why it was deemed an illuminator, rather than an eye shadow. I'll be using it on my eyelids. Somehow, I need to convince the Armani team to produce this shade in a single eye shadow. It's a taupe lover's dream. I don't understand the selection of the two brown shadows, Brown and Earth Brown. Granted, they are different shades, but why two in the same palette? One (at the bottom of my arm) is a cool brown, and the other is a warmer brown with its slight mauve hue. They offer similar intensities/saturation. I like the cool brown the best, so the other is likely to survive the other shades as I use the palette. As you can see in my photo, the mirrored, double-deckered compact comes with little sponge-tipped applicators. I would rather have had more product and no applicators. Armani could have used that whole space for the taupe shadow. Think I love it? The new Easy Chic Face & Eye Palettes are currently available at Nordstrom's Web site (and stores where there is an Armani counter). They have not been posted at the Giorgio Armani Beauty Web site, and they have not arrived at all stores that offer Giorgio Armani cosmetics. They will arrive soon, I'm sure. It's just so easy to shop online at Nordstrom, with its free shipping and relatively quick delivery. I can't wait to see Neo-Black (#1)! I expect it to roll in this week. I'm much rather have the Chanel Fleur de Lotus blush and eye shadow palette. They are much more gorgeous than this! Aww, choices, choices. You can't go wrong with the Chanel shades. Just don't delay. They are going to sell out. I agree with anonymous, though if I had it my way I would just get both! I was at Bloomingdales yesterday and picked this up. It was the last one they had in stock of the brown. They are selling like hotcakes! To me the blush is a standout. Wish they would offer this up for individual sale. I love the taupe too and will be able to use the shade next to it just on my eyelid. I had the SA at Bloomingdales apply this to me and she mixed all three shades together to line underneath my eye and it looked great. I agree with you CG, the taupe and the blush are the best parts of the palette. Becca, the blush and the shimmering taupe were - to me - the big event. Worth the money, but I'm always an Armani fanatic. Lucky you! I wish my friend Loyd were still with Armani and could apply this for me. He's a Chanel guy now - still great, but not as interested in Armani. 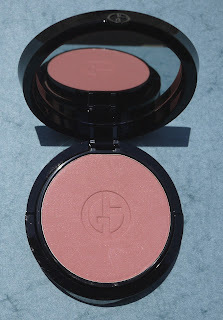 Is the blush similar to Armani blush no 10? It looks similar to my eye! thank you! Actually, no. I must have five #10 blushes - one of the best of all time. I mean that. One of my all-time favorite blushes. This one is, to my eye, more sheer (can you believe it? ), and it has no shimmer. That light, easy on the eyes shimmer in #10 makes it unique. Hi Lulle, it is pricey. No denying the upward creep of European cosmetics.